I am frequently asked the following questions: “Is a metal roof right for me?” and “Is a metal roof right for my home?” Those questions then lead to an interesting exchange in which I ask about the home and also about the homeowner’s needs. One question I always ask is “How long do you plan to stay in your home?” The answer to that question can be a huge deciding factor for many homeowners. Despite the rapidly increasing prices of asphalt and fiberglass shingles (up as much as 20% already this year in some cases! 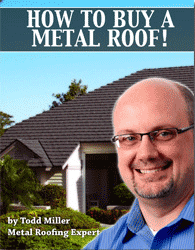 ), residential metal roofing is still usually a higher investment than temporary roof options. Some of the pay-off to that investment comes immediately with increased home value and beauty but some of the pay-off comes over time with energy savings and freedom from maintenance. One response I am hearing increasingly is something like “Well, I intend to stay here until I die and then I am leaving the house to me children.” Now, there can be variations on that theme. Sometimes the house might be going to grandchildren or a niece or nephew but the point is that, either as a gift or an arranged sale out of the estate, the house is being passed on to a future generation of their family. In older European and Asian cultures, this concept of passing a house on to the next generation has been common for centuries. It’s a little unusual in the United States and Canada but, given current economic conditions, it can make a lot of sense. Many younger folks are not able to buy homes as young as generations once did. Additionally, selling homes can be a tough venture in many markets. It may take many months or even years to sell a house and then, often, the sale occurs at a below-market rate. In the case of a house that is part of an estate, this can drag out probate a very long time and also diminish the total value of the estate. In the case of a homeowner who intends to leave their home to a future generation, metal roofing makes huge sense. It’s a great way to add value and beauty to the home, increasing the legacy that is being passed forward. It can also reduce utility costs for the original homeowner as they finish out their years in the home. And, finally, it leaves the next generation with a maintenance-free situation rather than a roof which is going to require funds in order to be replaced soon.